I have been using the sister version to this mod. The update to this mod is very subtle, i guess. I really did not notice any change in the mod, but it is nice to see the people doing this mod are willing to do updates. 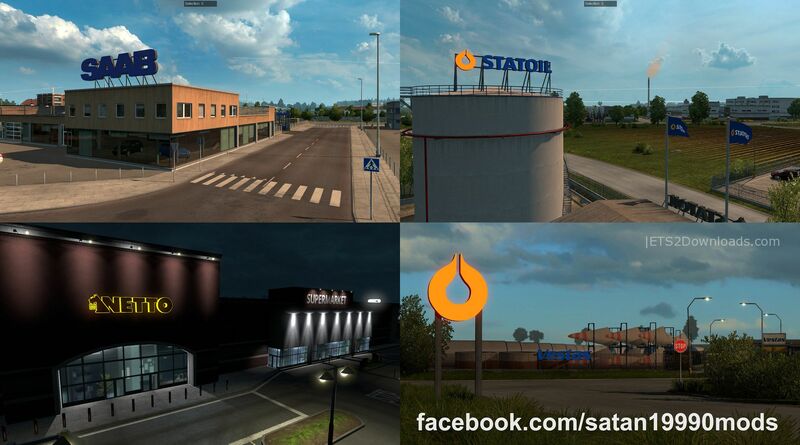 What you will find, is better texture’s on some buildings, better signage on fuel stations as well as all the pickup and delivery points. Plus you will see sign’s on top of the truck dealers, witch is a nice touch. I also noticed that some of the building that you pickup and deliver as well as the dealers were painted. That’s a real nice touch. I would definitely recommend this mod to any one that want to change there game a bit. 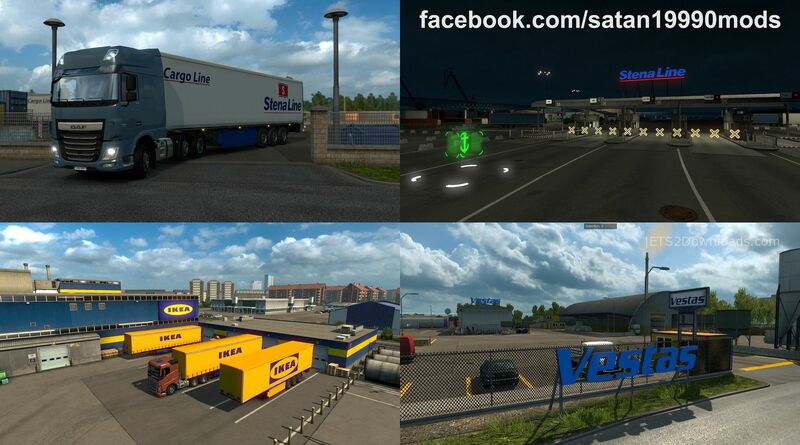 Real Company mod will replace all company names and logos in ETS 2 with the real ones. Real company v2 is fake ! Don’t use this mod. Name of company in map hide, some company buildings disappear and truck drop down in hole. Works fine for me. However with the new 1.22 update it’s a bit unsable. Thanks for your suggestion mate! Is this mod working good? Of course buddy. Still working like a charm! Can you re-upload the rar is corrupt, thanks. hmmm I am so sorry, I don’t have permission to reupload it. But you can try to download it again. I have downloaded and it worked fine! hmmm I have updated the new download link from the author, please check again. Thank you so much! Same it is still corrupt, did you change the link on this page? as the download link still goes to a file on share mods that was uploaded on 2015-06-21 11:24:01. The link on this page is the original but I have updated the new download link from the author for you, please try again! i get a lot of errors only with that mod and a lot of textures are red! Found the problem that is the fix for the main mod! Please add a link for the main mod in the description otherwise a lot of people thinking this mod isnt working. Found a solution! Main mod is for 1.18! And the fix only for 1.19. Using the main mod works perfect now on 1.18. For a long time this mod hasn’t updated much consistently. 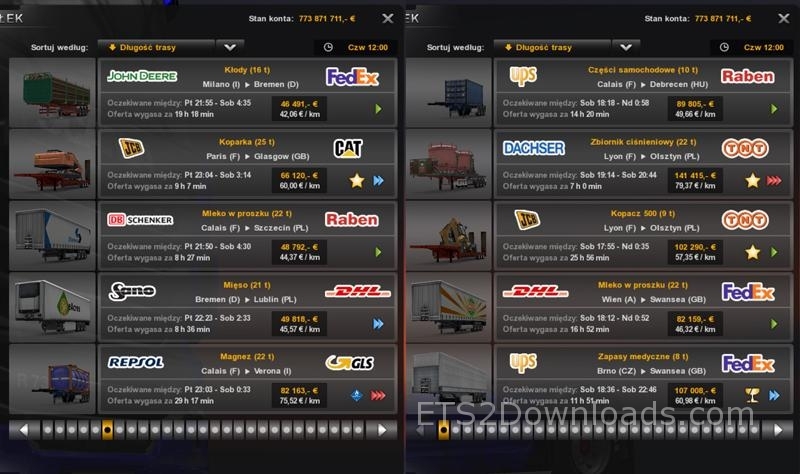 Finally, one of my favorite mods for ETS2. Thanks! hi you know if working with the tsm 6.1 map? Update for 1.22 please? 🙂 Keeps crashing with new update. The new version will be out soon buddy!